I’m really having a lot of fun with this. And I’m really glad that many of you have gotten some good ideas from part 1, 2, and 3. And I think it’s fabulous. And flattering that you don’t hate my color choices. But here’s the latest project. Don’t worry, this bed will be covered in vibrant pillows. I bought this headboard at the thriftstore for $10. It was in rough shape. But I sanded it all down, bought some stain that was on sale at Lowe’s for $3, and then coated it with polyurethane that I had left over from the chairs……..
A new headboard for our room. **I can’t wait to add the pillows. Also, if you look closely, it’s a bit rough in some spots. The wood wasn’t the best. However, I kind of like the inpuritites of it all. Especially because the furniture in the room is mismatched…..so it works. That looks beautiful! Could you do a tutorial on refinishing wood? Thanks! Oh my goodness – that is awesome! WOW!! And for the grand cost of $13 – holy cow. I think I am heading to the thrift store today. I was looking at headboards yesterday and found a great deal (or so I thought) for $149. I hope I can get lucky and find a great deal / and do it yourself project like you did. You are an amazing woman! WOW WEeeeee! I sure hope you've invested in a sander. It makes life a lot easier if you haven't. I love the color you chose, it makes the headboard look really rich and decadent. Great job! Way to go! and for $10, too! I think the rough spots add great character, although, I didn't notice them until you pointed out and even then it took me a while to find 1! Can't wait to see it with pillows! I also made a little dress for my niece out of an old sweater thanks your awesome tutorial. I still have to finish sewing one sleeve, but I'll be posting pics on my blog once it's finished. Nicely done- and so cheap! And P.S. – I'm from Georgia, so I LOVED your beach pictures. Gorgeous! I hope you're loving it! I just discovered your blog (really- last night) and … I pretty much think you're the bomb shiznat. :) That's right. Bomb shiznat. It's a compliment. Your skills and courage to practice them are very admirable. I intend to "blog-stalk" you from now on. Thanks for sharing all of your awesome projects! Great idea. I need to do something like this since our bed sits on the floor and is in need of some love. I just found your blog yesterday, and already subscribed. I also have a list of at least 15 things you've done that I now have to try — love it! Thank you so much for sharing your talents with the world! What a great find! It looks so good! Oh wow! Yay you!!! !And $13! I do want to tell you that there are these pretty embellishments at Lowes and Home Depot that i have been wanting for a spot in my kitchen that might be perfect stained and in the square part in the middle. Some are filligre or like scrollwork- in the wood dept. Just an idea. I have been wanting a headboard for so long but havent decided to let go of some money, and havent found one with potential like yours! Ive even seen ones made from old doors. But havent even found a door that spoke to me……. keep up the good work! Oh wow! It looks fabulous! Oh my goodness can I just tell you that I think you are amazing! I love every thing that you post! You make it look easy and that I could do it! Thanks so much! Wow, I love what you did. Mahonica, I put the stain on with a sponge brush. The polyurethane as well. But you could use a regular sponge or even a rag. You just don't want link or anything to get on there though, so be careful what you choose. I have to say that your blog is my all time favorite blog. I love it! And I love that you have a whole house to fill with new stuff! We are hopefully getting into a house this year and I am sure that I will be using many of your tutorials for myself! Thanks for posting so many great ideas. Very nice! A classic style. Dark wood is always nice. love it! Thank you so much for sharing your talents with the world! I gave a headboard to the DI that looks exactly like this! I never would have thought it could look so great! Maybe I should think about things a little more before I give them away! Thank you for sharing all of your ideas! 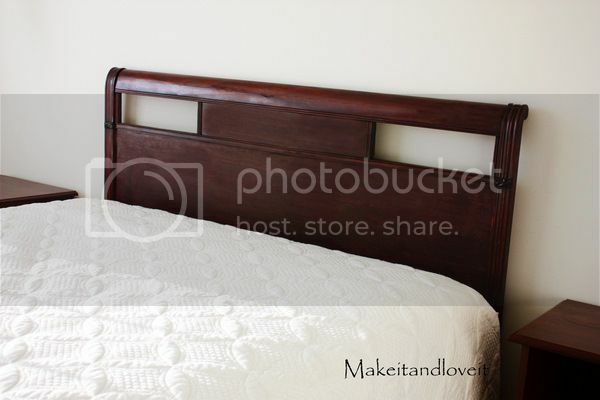 Your headboard turned out awesome! My husband and I like to try to do little do-it-yourself projects to save some money too. We recently made a pine log bookshelf and will be making matching end tables and a TV stand! Another project we have going is making our own canoe paddles. It's so fun and rewarding to do things yourself!